I was in Newcastle for the National Young Writers Festival, part of the This Is Not Art festival. Most of the time I spent doing festival-related things with all the very talented, very good-looking festival attendees. But the festival did not exist in a vacuum. It was in Newcastle and Newcastle was undeniably part of the experience. When I had a few spare hours I’d go walking around the streets, and this is some of what I saw. I took a walk down to the beach. It was an almost cloudless warm sunny day, with blue, blue sky. A bunch of teenaged surfer boys sat nearby. The smell of tomato sauce on a discarded burger wrapper, a faint aroma of the ocean. Sweat, bodies, swearing and bragging. Cheap men’s deodorant is sprayed on a cheap man. The best thing, this was September. Hunter Street is what I think would be called the main drag. It’s a long street that goes into the heart of the city. It’s ideal to drive up and down on a Friday night. Newcastle has had some tough financial times and there are a notable number of “to lease” signs in empty shop windows. This isn’t necessarily a bad thing. A flier in the festival program pointed out that Newcastle isn’t a bad place to live if you’re a starving artist. Rent is cheap – both housing and work space. It’s possible to be on the dole and not have to spend all your money on food and rent. 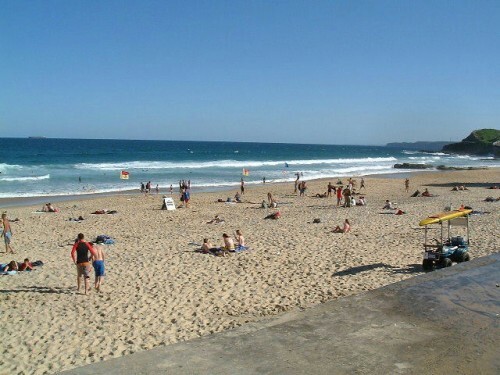 And the best thing is, Sydney is a mere two hour train ride away. Damn, if I could get the dole in Australia I’d consider moving there. 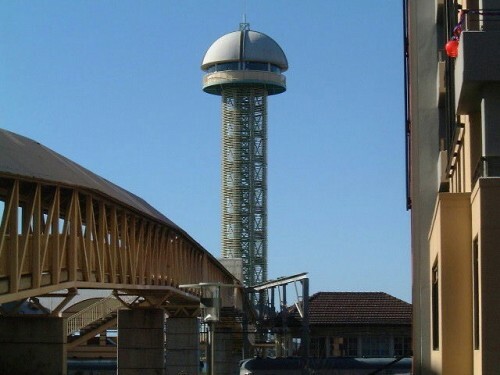 There’s this lookout tower down by the foreshore which I believe is affectionately referred to as the Big Donger. I had a few hours to kill on my last day and was walking around so I took a walk up it. It reminded me of walking up the Amedee lighthouse in New Caledonia, but rather than a view at the top of a tropical island, instead I had a view of Newcastle’s industrial areas. It was also a little unnerving knowing I was standing inside a big donger. 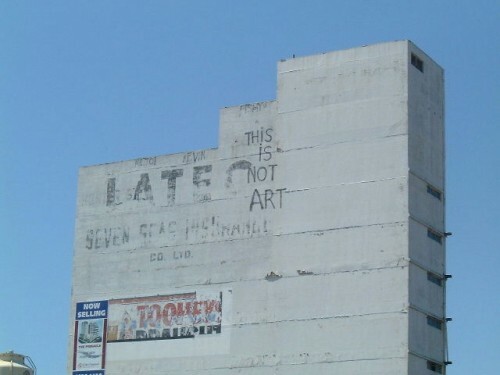 The This Is Not Art festival was not the only thing going on in town that weekend. In fact, most of Newcastle only care about one thing: the Newcastle Knights had made it to the NFL grand final, mate. The city streets were adorned with the Knights’ colours of red and blue. 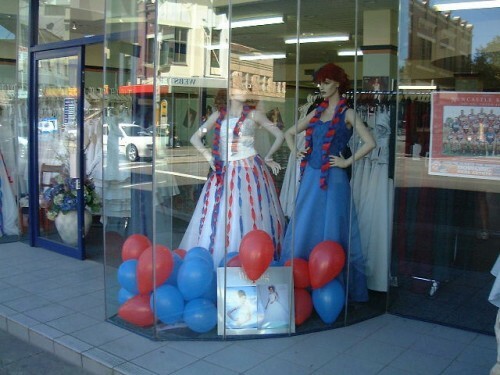 Some businesses just put up a few balloons, others went as red and blue as they could. I’ve lived in a city obsessed with footy before. I’ve been in Hamilton when Waikato won the Ranfurly Shield and one of those mooloo parade things was held, I’ve seen the streets of Hamilton adorned with red, gold and black, but I’ve never seen anything as major as what was going down in Newcastle. Imagine a small town, that maybe has a bit of an inferiority complex. It’s managed to get to the grand finals and is up against a team from big city that it’s often in the shadow of. Now, multiple that by 100, add some beer, and that’s kind of what it was like in Newcastle. 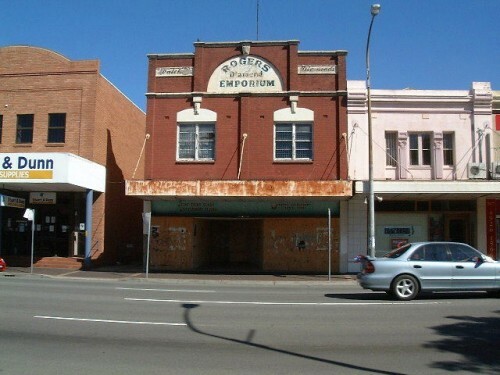 The Knights had won once before in 1997, and the city of Newcastle was expecting them to win again. Sunday evening was madness. Me and my rad new festival friends were in search of a pub. The local was closed. We eventually found another that was open. There were a few TV sets scattered around the bar and most of the locals were gathered around those and they were getting pretty excited. We left and went back to the bar at one of the festival venues. We were sitting around talking and I suddenly became aware of the noise of car horns going off. Someone asked, “did Newcastle win?” Oh yes, they won. Walking down Hunter Street, we were surrounded by drunk revellers clad in blue and red. “GO THE KNIGHTS!” they yelled. “NEWCASTLE!” Cars drove up and down Hunter Street adorned with ribbons, balloons, flags. One even had red and blue headlights. One of my posse was a little bit annoyed that the Novocastrians were overshadowing the festival. I got a little cynical and yelled out, “go ambivalence!” But ultimately it was pretty fun being surrounded by all the intense revelry. Getting a taxi back to my hotel, the driver told me that the Knights were a top team. You see, they had got to the grand finals twice and won twice. I didn’t ask about all the times they hadn’t even made it to the grand finals.